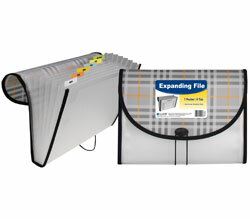 13-Pocket Letter Size Expanding Files are made of durable, acid-free polypropylene. 13-Pocket Letter Size Expanding Files are made of durable, acid-free polypropylene. Includes write-on tabs and button and elastic closure. For 11 x 8 1/2 document storage. 13-pocket/12-tab size. Blue.